We explain in details and with many pictures how pu-erh tea is processed, you can have nice views of the Xishuangbanna tea mountains and accurate maps. Have a nice reading! A co-worker recently gave me this beeng cha, and aside from it appearing to be a ripe puerh, I have no idea which factory, recipe, origin etc....any help would be greatly appreciated! I am new to the group, please contact me and add me as a friend and send me any posts to the group that you think may be helpful. I look forward to having tea with you and enjoy social bookmarking. Rcently, the government of some areas are pushing to convert all the Taidi plantation into eco-tea gardens, meaning making the bushes less dense and planting other trees in between the tea bushes. Most importantly, to stop using fertilizers and pesticides. Time will tell how successful this movement will be. After drinking Puer Tea for more than ten years, I have found out that Puer tea do have some medical properties are able cure some common illnes like flu to reduction of clorestrol. Below are some of my understanding and beliefs. Drinking purple Puer tea leaves could reduce glucose level in the blood stream. 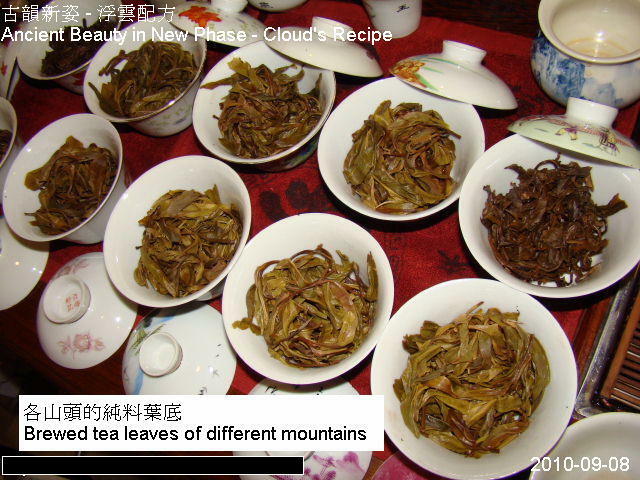 ( I have found out this understanding through a documentary program regarding Puer tea and had personally tried this type of tea and found out that it is effective only after drinking this type of tea. Effectively reducing Hyper tension by drinking raw or cook puer tea continuously for two weeks . Effectively reducing the waistline by drinking raw puer tea. Have anti septic properties by washing tea liquor on open wounds. Drinking puer tea are able to clean and clear liver fats. I personally found out this understanding as my yearly check up had indicated that my liver condition had got better from year to year without any medication. Be able liquidfy the blood density or to reduce the acidity in the body. This was proven that Puer tea are alkaline in nature and are able to neutralise the acidity level in the body. Be able to minimise certain cancer cells from developing in the body . There are many reports in this belief. The antioxidant in the Puer tea are able to activate the brains cells. Therefore some people are not able to sleep after drinking puer tea at nite. Recently experienced an interesting tea tasting episode.It happen as I was running out of old Pu-erh tea.Contemplating the inevitable situation I sunk into a depress state of mind, just as I was going to console myself with a bottle of Moutai I thought I will have one more look in the tea cabin and their it was right at the back, a jar of Poo-poo Pu-erh. The next day I took it to work where I had a little cake of old Pu-erh Tea (-25 years).I brought some spring water to a full boil,and wash the tea and left it to open up, after a few moments I open the Poo-poo Pu-erh an mix about a tee spoon full.It stuck to tea like bread crumb to a chicken leg.After I brew it I pour it in to a tea jug(no filter)and let it settle for about five minutes then pour it.The sublime taste was like earth mix with honey,I could feel it long after my first sip, deep in my chest rich but slight,smooth and perfectly balance.I notice that my body was cooling and the chi was balancing it lasted four about five hours.The tea had no edge or comedown it just merge with the environment .If you want to cool the inner body I recommend Poo-poo Pu-erh. Hi Folks, I've got the once in a decade (once in a decade for me at least) opportunity to travel to Yunnan. Xishuangbanna is on the itinerary, of course, but I don't know where in that region I can go see the tea first hand. This has been a dream of mine, to go see a real tea plantation or tea producing area, well, for over a decade now. I've got only two days, so I've got to make them count. It would probably be good to avoid the kind of places where all of the Chinese tour groups go with their little matching hats. Somewhere quiet would be better. I don't really plan on buying puer (unless somebody here recommends some friend or trusted seller) because I figure that if there's one place to get ripped off buying tea, it's in a tourist/ tea producing area like Banna. Plus, I can buy all the puer I want down the block from my house in NE China. It would just be nice to meet some of the people who grow/pick/produce puer and enjoy a cup or two. This forum really has some impressive figures in the puer tea world, so it is a really wonderful opportunity to ask this question. Even though I leave on June 17, I'm sure that others in this forum, who have an opportunity to travel to Yunnan, would also benefit from any travel suggestions that members have no matter when they post them.